This morning I had a HUGE waffle bar for my roommates. Kodiak cakes are the BEST! 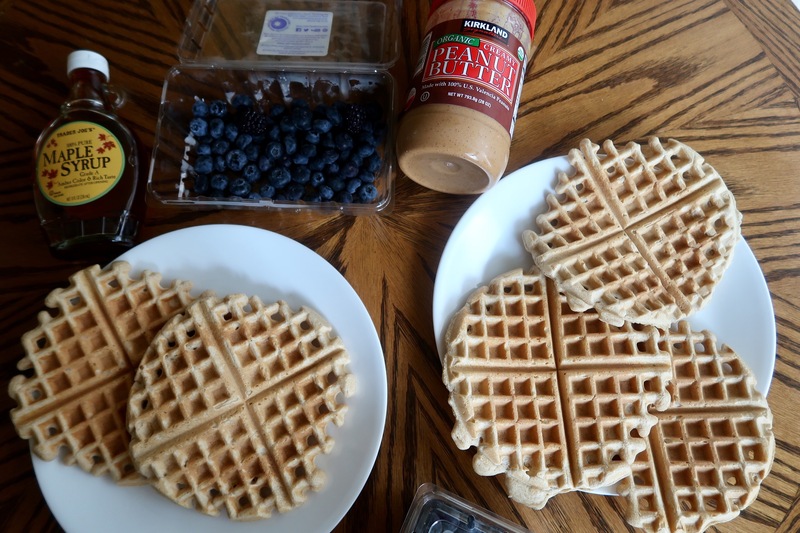 You just mix the batter with water and pop them in a waffle maker & you have a high protein / carb breakfast. I LOVE EASY! Big , healthy / nutrient dense meals are important everyday but CRUCIAL when you are sore. Think of it like your body is REPAIRING itself, it needs quality energy to give you the body you work hard to have. Definitely going to hit the GYM today. I’m trying a month pass at a gym near me so fingers crossed that I will stay at this one. After my week of home workouts & yoga I’m pretty sore. When I’m sore it’s STILL important to workout because I need to move around/STRETCH all the lactic acid & muscle fibers that are trying to repair. Also, working out while sore helps recovery time !! When I’m sore my favorite workouts to do are all about raising my heart rate aka cardio (I usually stay away from heavy weights). Jump squats, jumping lunges, sprints, stair stepping, jumping jacks, high knees are all workouts I like to incorporate into my “sore days”. It feels SO good to get everything moving especially when i’m sore. Preferably, I like to go OUTSIDE on cardio days but today it’s kinda rainy & wet outside so I’m going to hit the gym instead. After my workout A LOT of stretching is neccesary so I will take a yoga class or stretch at home & roll out on a foam roller. TIP OF THE DAY TODAY: WORK OUT & STRETCH WHEN YOU ARE SORE ! at the very least use a foam roller , roll out your whole body & stretch. If you want to be a mega fit babe go for a quick cardio sesh (20-30 mins at the minnimum)! && if you aren’t sore check out these videos and try them out (I promise you will be sore)! Anyways, off to the gym! !